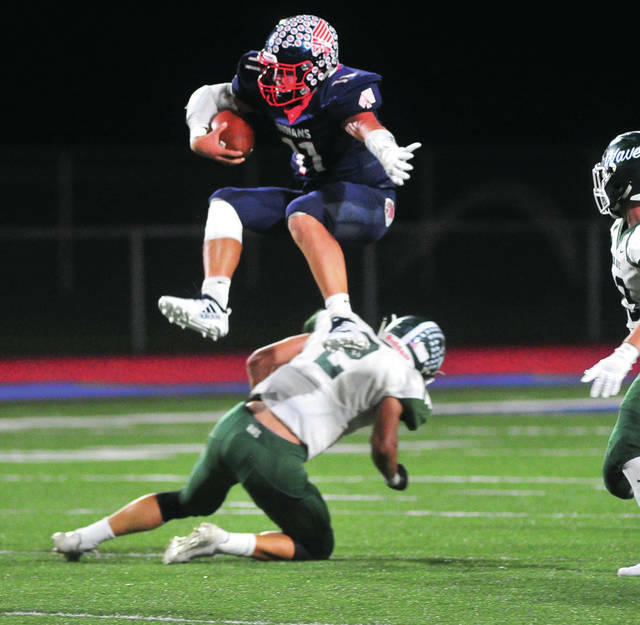 Piqua quarterback Mick Karn hurdles Greeville’s John Butsch on a first-half run. 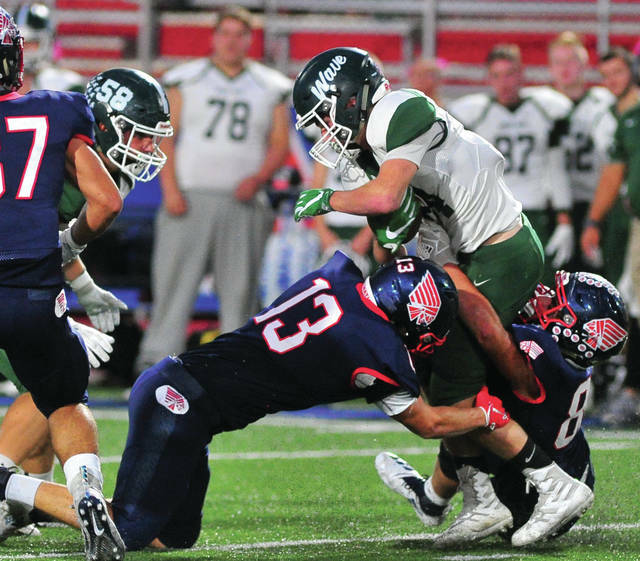 Piqua’s Nickoah Medley (13) and Brennan Toopes bring down a Greenville ball carrier Friday night. Piqua’s Owen Toopes is chased by Greenville’s John Butsch Friday night. Piqua’s Makeegen Kuhn looks for an opening against Greenville. Piqua’s Matt Blankenship battles his way into the end zone as Brennan Toopes blocks. 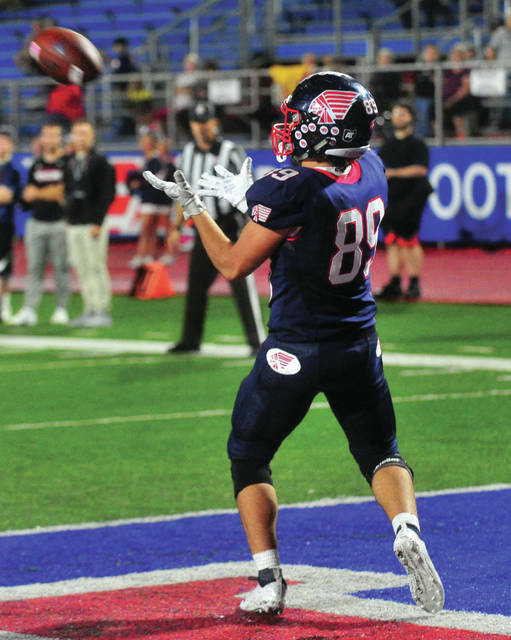 Piqua’s Brennan Toopes catches a TD pass Friday night. 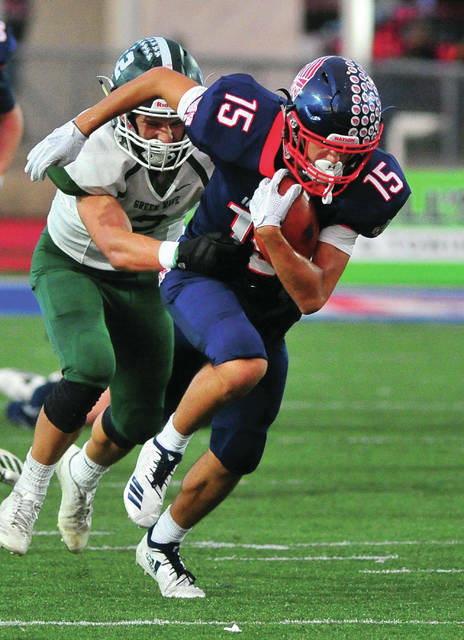 The Piqua football team set the tone early — and made all the big plays early in a 42-7 win over Greenville Friday night in Alexander Stadium/Purk Field. The Indians to 5-2 overall and 2-0 in GWOC North play, while Greenville dropped to 3-4 overall and 0-2 in GWOC North play. 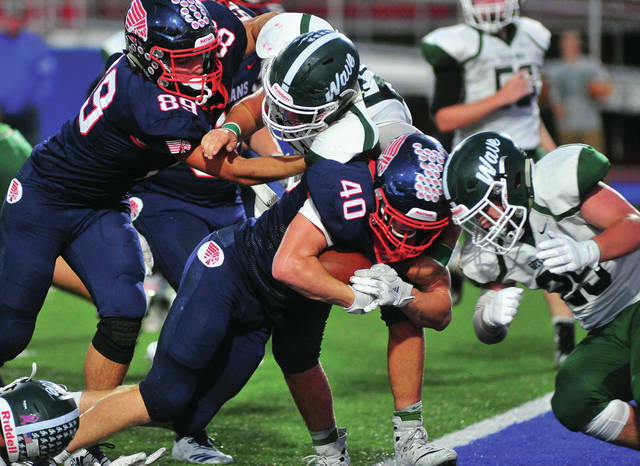 “There were a lot of big plays out there,” Piqua football coach Bill Nees said. Piqua went 54 yards on the opening drive, with quarterback Mick Karn running 21 yards for the touchdown. Karn lost the ball after crossing the plane of the goal line and it was originally ruled a fumble, before being changed to a touchdown. Jerell Lewis ran for the PAT to make it 8-0 Piqua. After several Greenville three-and outs, Piqua put together a 4-play 75-yard drive. Karn continued a big first half, running 68 yards to the one-yard line, before Matt Blankenship ran into the end zone on the next play. Blankenship added the PAT run to make it 16-0 with 2:02 remaining in the first quarter. Greenville followed with a drive that would yield the Wave’s only two first downs of the half. But, on a first-and-10 from the Piqua 43, Marcus Wood broke loose for what looked like would be a Greenville touchdown. But, Piqua defensive back Zane Beougher knocked the ball loose at the Piqua two and Blane Ouhl recovered it in the end zone for a touchback. Beougher said he was just trying to make a play. Piqua then put together a 19-play 80-yard drive to go up 22-0 at halftime. Karn had a 35-yard run as Piqua had moved all the way to the Greenville 28. But, after Piqua punted with fourth-and-40, after 30 yards in in one play, Greenville roughed the punter to give Piqua a first down. penalties. “We need to make sure our aggression is in a positive way,” Nees said about more costly Piqua penalties. On a fourth-and-nine play from the Piqua 11, Karn found a wide-open Brennan Toopes in the end zone of the touchdown to make it 22-0. “There were just a lot of big plays in the first half,” Nees said. Greenville got its only points midway through the third quarter when Wood returned a punt 54 yards for a touchdown and Ethan Flanary kicked the PAT. But, Piqua came right back. Trenton Foster had a 61-yard kickoff return to the Greenville 27 and Ka’ron Coleman would score from one-yard out. Karn passed to Garrett Schrubb for the two-point PAT to make it 30-7. On Greenville’s next possession, the Wave couldn’t get the handle on a pitchout and Piqua’s Owen Toopes picked it up at the Greenville 38 and ran to the end zone untouched. The PAT kick failed, leaving the score at 36-7. Piqua’s final score came on an 5-yard TD run by Karn, who finished with 188 yards on 16 carries and the PAT failed, making the final score 42-7. He also completed eight of 14 passes for 72 yards. Beyke completed 10 of 14 passes for 46 yards, while Wood led the Greenville rushers with 57 yards on two carries. The Piqua defense limited Greenville to 159 yards and seven first downs. 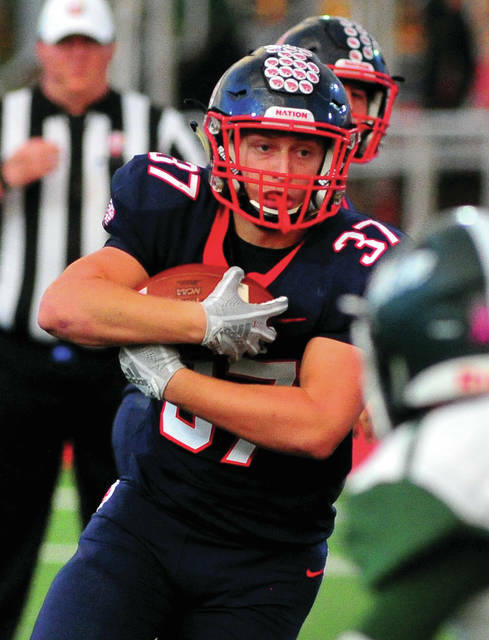 Piqua will be back in action Friday, playing at Vandalia-Butler in a big GWOC North game — looking to make all the big plays again.